A recent article in Forbes, “Venture By Numbers,” shows this situation is changing. Correlation Ventures started in 2011 with the philosophy to bring a quant-based approach to venture investing. Their mission was to stockpile 25 years of data on every venture deal consummated, evaluate this data with proprietary algorithms and then pick investments via pattern-matching software. While other VCs initially mocked them, just as baseball executives were certain Billy Beane would fail, they are now seeing Oakland A’s-like results. Correlation Ventures has made 85 algorithm-driven investments, with a $166 million fund, and their initial results are consistent with funds that eventually produce double-digit-percentage gains. Correlation does not take a contrarian approach to VC, it often invests in young companies that are also appealing to Sequoia Capital, Accel Partners, Battery Venture Partners, InterWest and Canaan Partners. In fact, Correlation’s algorithms weigh heavily the track records of the investors as well as the founders and advisors. Correlation Venture’s algorithms also highly value a company’s ability to spend money efficiently. It also looks closely at valuation, Correlation often invests in company’s in areas now over-saturated with investors (to extend the baseball analogy, it is like scouting in Japan versus Florida). 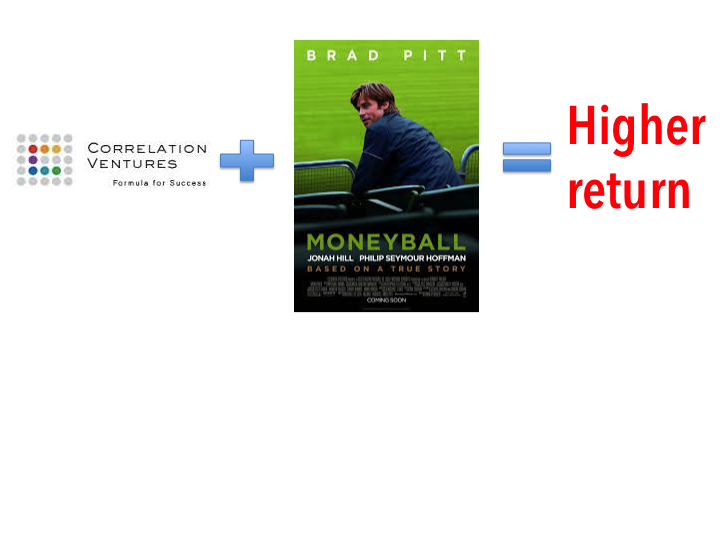 Correlation’s strategy and initial results begs the question what took so long, given that the Moneyball phenomenon started sweeping through industries when it was published in 2003, why eight years before the first application in venture investing. There are two reasons for this delay. First, you have a lot of very smart people running VC firms. While this does not sound like a problem, intelligent people over over-estimate the reach of their intelligence. They have gone through life often being right and with multiple successes. This creates a bias that they will be correct in other decisions, such as what firms to support and what founders to stand behind, regardless of data. Second, they have not had a reason to change. Even with a high failure rate, VC has had solid returns for investors and the venture capitalists have profited mightily. If you were making $5 million or $10 million or $50 million a year, would you look closely at ways to disrupt your business? I expect that quant-driven VC will dominate the investing landscape quickly. When Beane first used analytics to drive baseball-decisions, he was the only General Manager pursuing such a policy. His success, though, was very easy to quantify and other organizations started adopting his philosophy so they could see similar results. As the analytics based strategy generated more successes (such as the Boston Red Sox winning their first World Series in almost 100 years), baseball leaders not adopting such a strategy were forced out because their results were not as good (and easy to measure in wins and losses). The same should happen in the venture community, more mid-tier investors will copy what Correlation is doing, see similar improvements in performance, which will then force virtually all firms to move to a quant-driven strategy. You will then see improvements on Correlation’s algorithms, as competition will drive even better use of data. A side benefit should be a higher success rate for start-ups. By moving to algorithm-driven investment decisions, you will see start-ups try to “game” the system by building companies they know will look good to these investors. As the algorithms are refined, they will be identifying the underlying factors that lead to success and big success. This will create a loop where Founders better understand what is needed to create a hit company. Analytics-driven decision making has finally penetrated the venture capital community, with Correlation Ventures seeing strong results from a quant-driven approach. A Moneyball framework for venture investing is likely to displace the traditional intuition-driven approach just as it has in many other industries, including sports and video games. Analytics driven investing should also help start-up Founders build companies with a better chance of success.